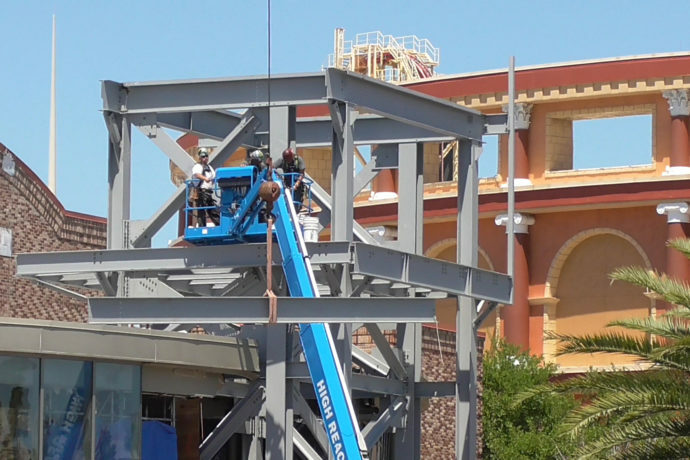 The factory facade is starting to take shape at the upcoming Toothsome Chocolate Factory & Savory Feast Emporium restaurant taking over the NBA City in CityWalk Orlando. This incredible facade will include towering smoke stacks and funky gadgetry that is certain to catch the eye of all visitors to Universal Orlando. The new steampunk themed restaurant is planned to open later this year. See the video as well as some snapshots of the construction site below and stay tuned for more theme park updates coming soon! Check out the previous updates for concept art, food, dessert and milkshakes pics, and more video! The facade is starting to look more like the concept art! That’s all for this update. Be sure to check out my recent Kongstruction update! See previous updates for this project here, and subscribe to the feed so you never miss a new post! And subscribe to my YouTube channel for more theme park videos and construction updates coming soon!